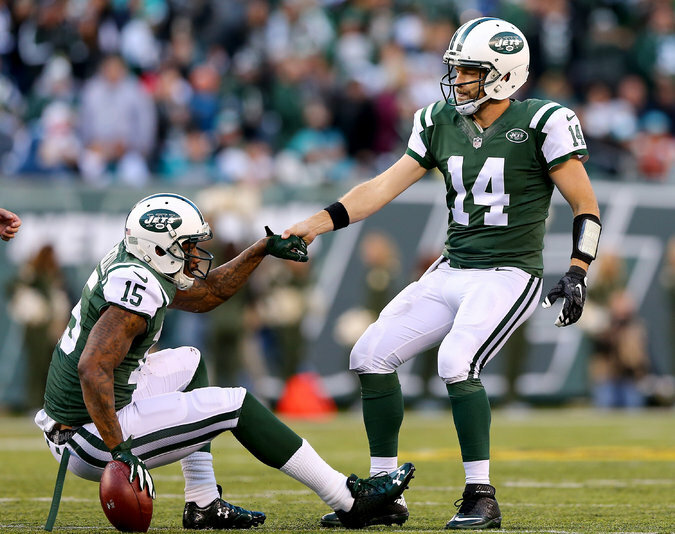 Ryan Fitzpatrick helping up Brandon Marshall in the Jets’ victory last Sunday. At 6-5, the team is in playoff contention. Come one, come all to MetLife Stadium on Sunday. The C students. The 12-handicap golfers. The middle managers. The occasion? A daylong celebration of the ordinary and the middling — warm coffee, half-cooked hot dogs and watered-down beer will be served — with the marquee event beginning at 1 p.m. That is when the game most emblematic of this N.F.L. season will kick off. Jets versus Giants in the Mediocrity Bowl. In this parody of parity, the winner enhances its postseason standing while the loser suffers the indignity of still remaining relevant in the playoff chase.